I see you there in the check out line. You’re wrangling all your kids and holding on by a thread just trying to get out the door. I see the phone call you just got. I know it all to well, it’s the one saying it will be later than he thought. The call letting you know that you are on your own again for dinner, bath and bed time. You just want some relief, an extra set of hands, someone to share in the grind at home but… not tonight. I get it and I see you. I am the wife of a fire fighting husband. His shifts are 24 hours long and end when the rest of us are waking up to start our day. He comes home exhausted and drained, desperate for just a few hours of sleep. His job is demanding and hard and requires more of him than I will ever understand. Whether you are the wife of a fire fighter, a shift worker, a police officer, a member of the military, an attorney, a student, a minister or any other position that requires long hours you are not alone. It seems that there is quite a large club of us these days. We moms who wear all the hats and juggle it all. It’s a sacrifice to be away from your spouse on such a regular basis and to feel like the home rests on your shoulders. But, learning to manage life like this long term is a skill and it’s one not everyone can do. There are long days and sometimes you feel like you are drowning but I promise, you can do it! 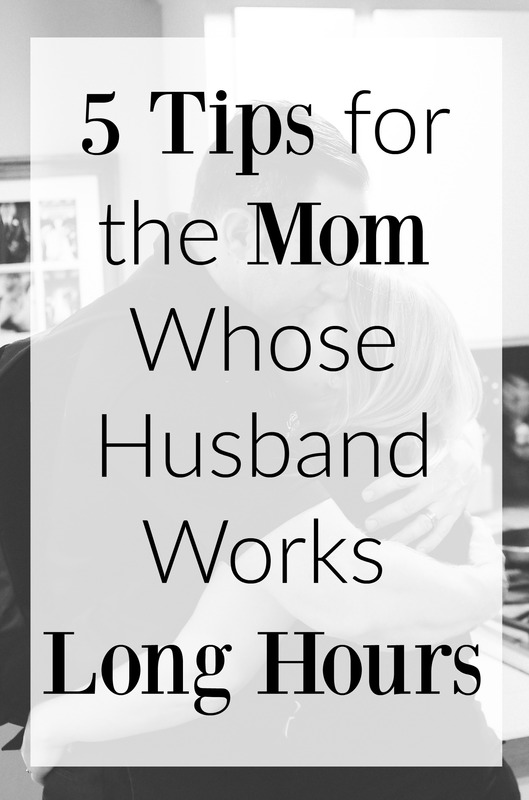 I am in no way an expert on doing this with grace but here are 5 Tips for the Mom Whose Husband Works Long Hours. The sacrifices our families make to have one parent away for long periods of time is huge. Some days these sacrifices seem much bigger than what we thought we signed up for. Please know that your feelings are valid but resentment is like a sinking ship. It is easy to allow our minds to wonder and to allow resentment to set in but don’t allow yourself to go there. I get it, sometimes resentment sets in over the simple fact that your husband got to have a conversation with an adult that day while you watched Disney channel for hours on end. Or it could be that you do not feel appreciated. Talk to your spouse and voice your feelings. Let them know how you feel and put words to your emotions. Sometimes when we are going in a million different directions we forget to tell each other how grateful we are for each others had work. I have to admit, this one is sometimes very difficult for me. I am the classic caller of all things frustrating and bad. My husband jokes with me all the time that I say I want more children but that when he’s gone all I do is complain about how crazy the ones we already have are. Here my poor husband is off working and away from us for days at a time and I drop issues on him making him feel guilty that he is not here to help. One thing I have come to realize more and more over time is that he feels guilty enough on his own. He knows he is away and he misses us like crazy. But, bombarding him with guilt only pushes him to self doubt. It will force him to question the husband, father and fire fighter he is. Do better than I do and do not fill them with guilt. Friends, you HAVE to find friends. Creating a community for yourself of other moms who understand your family dynamic and can encourage you is huge! I have been blessed with a group of women whose husbands are PA’s, fire fighters, in the army etc. who have husbands gone for days and even months at a time. Having these women to vent to and support me is a life line. Look on Facebook, there are groups for everything! Become friends with the wives of your husbands co-workers or even seek out the mother’s of your children’s friends at school. Create a community that is going to lift you ups when days are hard. I promise you, every mom is seeking to connect with other moms. Alright ladies, you have to live! Look, I get it. The idea of getting out of the house with your entire crew and spending the day at the zoo can be daunting but do it! These times in your life with your children are moments you will not get back. You must live and create memories. You and your husband are both making sacrifices but I am willing to bet he is not asking you to sit around and wait for him to get home before you start living. Get out there and create memories, your children will thank you for it! We are living in some of our most difficult times as parents as we raise our little ones up. But, what we cannot do is allow our struggles to over power our hearts. As wives the most important things we can do is encourage our husbands and pray for them. We must pray over their hearts that they would seek God’s will for our families. Pray that they would know how appreciated they are and encourage them to be a better husband, wife and co-worker. I know that this is sometimes easier said than done when you are living in the trenches but rest assured that God will use it. He will use the encouragement you have given to draw your husband closer to Himself, he will use it when your marriage needs it most to remind each of you of how much you love each other and He will use it in may other ways that we may never see. Most importantly, He will use it in your children’s lives as they see what it is like for their parents to love and encourage each other through every aspect of life. Moms, I know some days are really really hard. I know some days you would like to run away for a few moments alone but remember you can do this. And most of all, you are not alone! Love this post b/c I can realte to every single point you made… especially the resentment part :/ I tend to forget that my hubs demanding job is such a blessing b/c he is providing for this nice house and our nice things. Thank you for the lovely reminders in this post! I think your amazing person. We decided a different route. After 5 years of dealing with my child with disabilities and being a married single parent, We decided, that his guilt at not being around and my resentment and unhappiness were becoming a miserable unconnected couple. I needed to think of my child and myself and not everyone else’s family. Our family seemed to be not a priority. He felt horrible and I was constantly sucking it up and hiding and crying. The work he does is important but so are we. We divorced and are cordial. I’m a better parent because I am happy. This doesn’t mean it can’t be done but it means that you have to realize you will never be as important as whatever the job is. Some can accept it, others cannot. I’m now active and looking for a person who we can be at the top of his list. Keep fighting the good fight. Wishing you all well. Great inspiration! Just what I needed thank you! I needed this, thank you. I’m a wife of a lineman who has spent weeks from home after storms like Sandy. We even moved to a brand new state which I knew no one and then he was gone a lot. Lots of great advice here. One of my great friends I met in a Target when I was that mom you opened up with and she just said hello and your doing great. Number 3 I think is so very important. Friends! Friends to pray with, friends to grow with. Also your last. I can’t count the times I’ve called my hubby in the middle of it all and said…..thanks for working so hard for us. We’re here waiting for you. We love you. I even put 3 littles (under 5) in the car and we drove 8 hrs to a storm cleanup where all of the linemen were put up in a hotel to sleep (not common) and waited until all of these bone tired guys walked in to the hotel after working a couple days straight and these little kiddos weaved among them screaming daddy and every face smiled. I so agree that they have a lot of guilt about being gone long hours too. I can totally relate and honestly it has taken me quite a few years getting used to my husband’s schedule with Houston Fire Dept. He also owns his own business…so he is constantly working it seems. I have learned to let him get a nap first thing if he needs one (even though I really, really need a break). It always works out better for everyone in the end if he gets his nap in first. One of the best comments I ever heard to prepare me for a lifestyle of my husband being gone for crazy hours was, “Don’t expect your husband to come home when you think, and when he does, you will be pleasantly surprised!” It is all about perspective! I so neede d to read this article at this moment! I married a farmer and am dreading what another month will bring us. I feel like this almost daily for about 10 months out of the year. I will bookmark and read this regularly. Thank you for the reminder that I’m not alone with this struggle! I needed this today, as I stumbled upon it! My husband worked all night then had to be back early to take his medic test this am- only to head back in. I’m in awe of how little sleep he can function on, but sometimes I feel quite isolated! This is even more true b/c we are currently down to one car- so once he leaves I’m fairly ‘trapped’ at home. I do take our son on walks around the area, but have recently just been longing for a ‘friend’. I appreciate all you had to say- I feel like when my husband’s gone, when he returns all I want to do is dump the last 48hrs on him- which doesn’t help anyone- info overload for him, and frustration on my part b/c he doesn’t respond the way I would like/need him too! LOL- but thanks for your words/encouragement! Oh! These are great tips for encouragement!! I’m a bit of an “older” mom. I’m 37, and I have a 3 year old. It’s hard to find friends when most moms with kids his age, are so much younger than me . I don’t have a lot in common with them….not to mention I don’t have facebook. These tips really help!! Especially the first one! Thanks a bunch. Amy- I am so glad these were encouraging for you. Finding mom friends is definitely hard. It is very hard to do! Thank you for this article, it summed up all my feelings. I am a stay at home mom of 4 married to a Correctional Officer. Between the shift work and the overtime it’s enough to make me want to scream sometimes. I especially related to the part about guilt. Some days I feel like all I do is complain about this or that. I try and catch myself! So thank you again for such an honest article; it made me realize I am normal!! Thanks for this post. Im a full time mom and a full time officer. My hours are demanding and so are my husbands. Many times I wonder how the hell we do it all, then I remember, I just don’t sleep! Thank you so much for this post! My husband works long days, with a 1 hour (each way) commute on top of that. I also work part time, and do not have a place to take my kids for childcare. Sometimes our schedules overlap, causing even more stress! I get jealous of moms whose husbands can come home for lunch or pick up the kids at school in a pinch. I felt like no one understood so I really needed to hear that I’m not alone! These tips are spot on and really help me! I am a mother of three, Taylor 14, Izzy 10 and Ethan 9 and I am the mother you are talking to. My husband is an EMT-I for Grady Memorial Hospital in Atlanta and this struggle is REAL! I truly feel like a single parent M-W. Additionally, my daughter recently had a liver transplant and it has added another layer to the “struggle”. I admonish anyone reading this to really take hold of the prayer as a means of encouragement. Even if it is the…..”I don’t have time to make this a real prayer but Lord…..HELP!!!!!! !” You don’t have to speak the words because he knows your heart! Through and Through! I also have to say……Husbands…..find ONE thing to do on those days you are at home and alone to take care of something that will make her life easier. My husband, for some reason, chose (of his own volition) laundry and doing Izzy’s med box every week for the week. It takes him the better part of a day to get done, BUT IT IS A LIFE SAVER FOR ME! I didn’t have to ask him to do it but he just started doing it! This also helps with my resentment towards him. I really don’t have any because I know…..A) He would rather be with us B) When he can….He does! Great article!! My hubs is a fulltume FF also and has an electrical buisness with 3 employees as well. We have a 7 & 3 yo , whom I homeschool. When we first made the transition to him being a full time FF I was soo bitter. He got to leave the stress of newborns and potty traing to go hang out with other adults, while I was at home. Thankfully 5 years later we have found our groove!! For us date night never worked it just turned into another point of resentment when plans had to be changed last minute. Now we take at least a weeks long vacation with the family and then another vacation just the two of us a year! It’s not for everyone but it’s what works for us. Thank you for this! I love that you have the same feelings as I do, staying home to raise 2.5 year old twin girls while my husband is gone 12 hours per day. And yes, it is soooo difficult to get out of the house, but once I make it to my destination, I find that I am happier! Especially at night when I am really tired. My 3 children are now adults, but when they were growing up I was essentially a single mom. From the time my youngest was 2…until he graduated from high school, my husband worked out of town (2 hours away). At first it was Tues-Thurs but then became M-F.
We made it work. It was HARD. WE ALL MISSED HIM & he certainly missed us! But we made the decision together & made it work. Even though, some days, I was very frustrated/frazzled, it was much harder for him…missing so much time with our growing children. I truly don’t know how my husband did it, especially once the kids were in middle & high school, involved in school functions. There were many times he drove the 2 hrs. for a function (after he’d put in a full work day)…then turned around & drove back the same night! You are so right in finding a support group!! My time was pre-Internet for the most part, but I was friends with several others who had the same family dynamics. It was a lifesaver knowing I had friends only a phone call away who I could call. We made it work. It’s what was best for his career AND our family. Because of that, I became much more self confident and sure of myself. The kids had experiences their peers did not (my hubs was in politics), meeting all sorts of ‘important’ people…and knowing how to greet those people with a firm handshake & an eye-to-eye greeting. How to ‘dress for the occasion’ and behave! Sure, we missed out on a LOT…but we gained much more. When our youngest graduated from high school, I moved to the city my husband was working (by this time he was out of politics and had taken an appointment by the governor). It was a joint decision with the kids to remain where we were…and go to a small school rather than a large ‘city’ school. Moral of my story…you are spot on with you 5 rules! People can make it work. Keep the faith. Things will eventually not seem so stressful!!! I needed this. My husband is a theatre sound tech and works some 20 hour days and 80-100 hours some weeks. Even though his job isn’t saving lives or anything, it’s still really hard on all of us (me and three little kids). I’m so guilty of trying to make him feel guilty for it. I’m really working on it right now. This post is gold. Although my husband isn’t on shifts that require him to be gone for long periods of time—he does have a long work day because of commuting. It makes a long day for me and I’ve often felt all of the same struggles. Thank you for encouraging us along the way. Grateful for your post! I really needed. My Love is a FF, working 48 hrs shifts. it was encouraging and inspiring to read your thoughts. No resentment, no guilt…and prayer…. I needed all that. Thanks! ‘Don’t let resentment consume you’. I NEEDED to read this. I loved every point you made. My husband is an attorney. 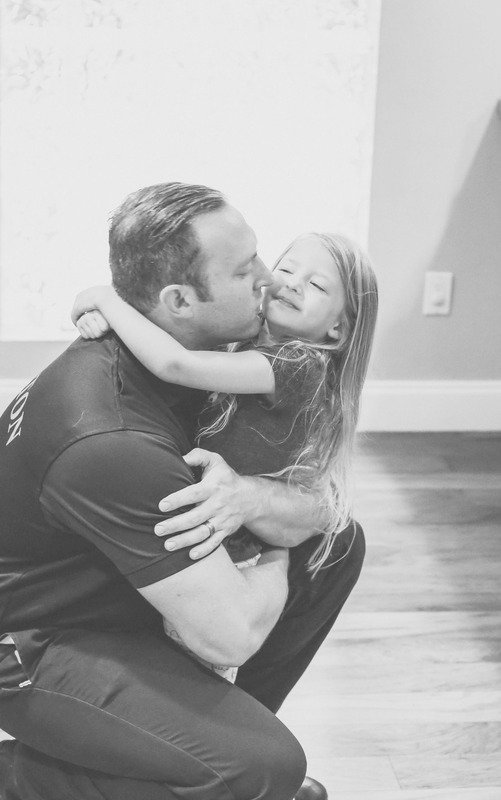 He works long hours and most weekends and whenever he is “putting out fires” for his clients. I’m always saying to him, “why do their emergencies have to be your emergencies? !” I started my blog because I finally decided I needed to do something for myself and I love to write! Thanks for the good read! Great, encouraging post, thank you. So what if ur husband doesn’t encourage you to get out but actually does ask you to wait to ” go to the zoo” or wait for his day off to ” go to the pool” so what do I get to do?? Crafts? Fun make a mess n clean it up. That’s what I get to do. We can read.. so we can go to the library without him so I guess I got that.. I don’t get this other mom support either. My 6yr old has autism so not a lot of mom’s want to hang out. He has melt downs n “he show their kids behaviors they didn’t have before seeing my son have a tantrum”. It sounds nice that army wife’s can group together but Autism mom’s got their hands full n don’t always get a chance to take their kids to a “circle time” meeting with other moms. Try to have a more positive out look on your day to day life. You will be a lot happier. Thank you so much for this post. I really needed to read this tonight. My SO is amazing but the time apart can be so hard on both of us and our daughter. I need to remember these points and that he is struggling too. Thank you so so much. It looks like something i wouldve written in my journal about myself. I just love this post. My husband was working away for 25 days. I have 2 boys! 7 and 2 and yes the 2 year old is running the house like a pro hahaha. Was so hard and then i found this perfectly written post. These tips also apply to single moms!